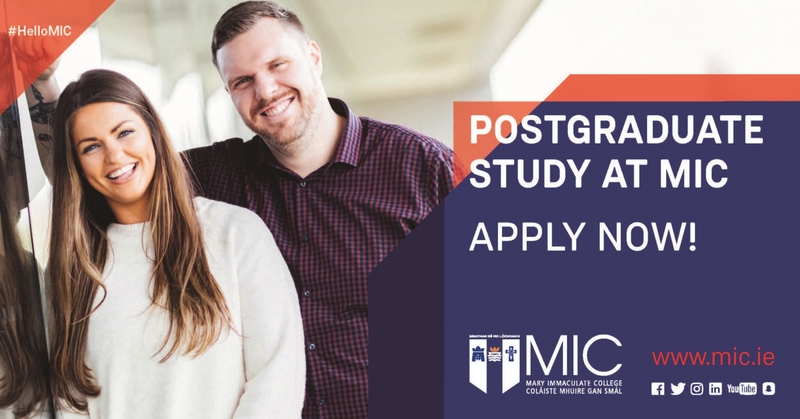 If you would like to be part of an innovative and creative learning environment, with excellent student supports and resources, apply now for one of MIC’s leading postgraduate programmes in the Liberal Arts and Education offered at Diploma, Masters and Doctoral (PhD) levels. Programmes include specialised MA programmes in Media Studies, History, Education and the Arts, STEM Education and Christian Leadership in Education. These established programmes are offered alongside doctoral programmes in areas as diverse as a PhD in Linguistics and a Structured Ph.D. in Literacy Education. Full-time, part-time and distance learning options are available across both taught and research programmes. In order to help meet the real world needs and costs of postgraduate research MIC also offers funding supports of €800,000 per annum through a Departmental Assistantships Scheme and merit-based Research Masters and Doctoral Awards Scheme. MIC systematically builds for student success by providing panel-based monitoring at review and progression points and a wide range of transferrable skills training such as academic writing, project management, research integrity and ethical conduct, distributed leadership, and presentation and conference skills. Students also enjoy innovative master classes and summer schools. The postgraduate community at MIC continues to grow and diversify with students from Ireland, the UK and EU studying alongside students from Brazil, Nigeria, Tanzania, France, Zimbabwe, Saudi Arabia, Japan, and China.